In the past few years, Marvel films have become very generic and “paint-by-numbers”. However, Black Panther breaks this streak and goes back to the days of old. It delivers a fun, yet serious, story that entertains as well as teaches a lesson. In the 1960s, during the height of the civil rights movement, Marvel comics took a big chance and created a new superhero, Black Panther, from the nation of Wakanda. This land was a more technologically advanced nation than any on Earth. Over time, the character became of the most beloved in the Marvel Universe, and now, in 2018, he finally has his own movie in the Marvel Cinematic Universe. Picking up right after the events of Captain America: Civil War, a heartbroken T'Challa (Chadwick Boseman; Marshall) returns home after the death of his father, ready to take on the title of King - aside from that of The Black Panther. However, unbeknownst to the new King certain secrets of the past will come to light that will challenge every fiber of his being as the fate of Wakanda hangs in the balance. Just like director James Gunn received a lot of creative freedom when he made Guardians of The Galaxy, director Ryan Coogler (Creed, Fruitville Station) did as well for Black Panther. He brought in his own DP as well as production designer to give Black Panther a look and feel never seen before in the Marvel Universe. Coogler and crew blended many different tribes and people of Africa to create an amazing interpretation of the land of Wakanda. A civilization that is light years beyond the rest of the planet with a proud people that have a deep tradition, as well as a very technologically advanced society. During its sophomoric years, the Marvel Cinematic Universe (MCU) has been criticized for having very wooden, one-dimensional characters. This criticism couldn't be further from the truth with Black Panther. In fact, Black Panther has some of the most complex and interesting characters that have been seen so far in the MCU. Chadwick Boseman embodies the Black Panther and T'Challa perfectly. Aside from just speaking his lines, you can see the deeper meaning in all his mannerisms. Michael B. Jordan's (Creed) interpretation of Erik Killmonger is one of the most complex and dare I say best villains showcased so far in the MCU. However, the true stars of Black Panther are the female actresses. Lupita Nyong'o (Star Wars: The Force Awakens) and Danai Gurira (All Eyez on Me) easily steals the film as the two proud warrior women of Wakanda while the performance of actress Letitia Wright (The Commuter) will be stuck in your heads days after you finish watching the film. One can only hope that Kevin Feige and the team at Marvel Studios will do a spin-off story of her character, Shuri, as it is a pleasure to see her perform. The 4K UHD release of Black Panther offers some of the best quality to date for Disney's 4K offerings. Details are sharp and crisp, and the vibrant colors of Wakanda literally jump off the screen (Thank you, Dolby Vision!). This is most certainly a combo pack where you can see the difference in quality vs the Blu-ray where the colors seem more muted and details more blurry after you watch the 4k edition. Aside from being full of visual wonder, the world of Black Panther and Wakanda are pleasing to the ears as well with the punched up Dolby Atmos soundtrack. The front channels provide excellent clarity to the dialog while the special effects and height speakers add a certain surreal effect that puts in you the middle of all the action and scenery in the film. It also provides a great showcase for the amazing score by Ludwig Göransson (Creed). 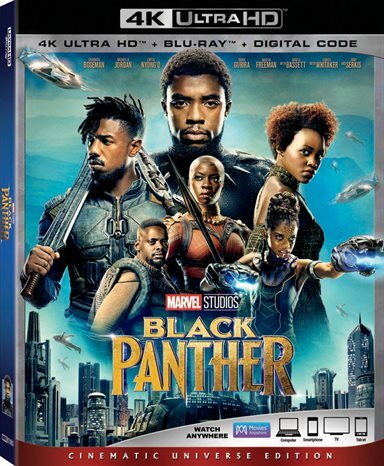 Black Panther, Cinematic Universe Edition, features a 4K, Blu-ray, and Digital HD (4K on some platforms) version of the feature film. It also has a four-part featurette that looks into various aspects of the production — Crowing of a New King, The Hidden Kingdom Revealed, The Warriors Within, Wakanda Revealed: Exploring the Technology. Other special features include a very short gag reel, fully finished deleted scenes (that honestly should never have been cut), From Page to Screen: A Roundtable Discussion - a look at the history of Black Panther from its creation to today, The Marvel Studios: The First Ten Years -- Connecting the Universe featurette that has been floating around online for the last month, a look into the summer 2018 MCU film, Ant-Man and the Wasp, as well as a 1:23 minute intro to the feature film by director Ryan Coogler. In the past few years, Marvel films have become very generic and "paint-by-numbers". However, Black Panther breaks this streak and goes back to the days of old. It delivers a fun, yet serious, story that entertains as well as teaches a lesson. Forget Avengers Part 2, bring on the Black Panther sequels sooner rather than later. Download Black Panther from the iTunes Store in Digial HD. For more information about Black Panther visit the FlickDirect Movie Database.